The first and only provider of Virtual Mailboxes in the Virgin Islands!!! Are you tired of having your packages sent back, we’ve got you covered? Receive your packages from online shopping and loved ones. We have the space to receive and store your packages. St. Thomas, U.S. Virgin Islands. The USVI Charter Yacht Show, the premier event in the U.S. Virgin Islands for charter brokers and crewed yachts to see and be seen, is set for November 11 to 14, at IGY’s Yacht Haven Grande. This ‘Best of all World’s Show’,organized by the Virgin Islands Professional Charter Association (VIPCA) features a unique chance for charter brokersto see an impressive display of sail and power catamarans,monohulls and luxury motor yachts in one location. It also allows crews, managers and local vendors to kick off their Caribbean season and promote themselves and their services at one of the finest global luxury superyacht marinas. IGY’s Yacht Haven Grande Marina is making it easy, and inexpensive, for crews to jump start their season early. First, the exceptionally low Show berthing rate of $1.50 per foot per day commences November 3 and extends through till November 22. Second, there’s an additional 10 percent early-bird discount for dockage paid in full before October 15. Third, the ‘on arrival’ fuel rate comes with a 15 percent discount. What’s more, yachts traveling north from the Southern Caribbean for the show or charter in this area afterwards can enjoy a five percent dockage discount at IGY Marinas in Rodney Bay, St. Lucia, and Isle de Sol, St. Martin, from November 1 to December 15, 2019. Over 60 yachts are expected to attend,including catamarans80-feet and longer and motor yachts in the 100- to 150-foot range. The latter is a segment of the Caribbean crewed charter market that IGY’s Yacht Haven Grande marina caters to in a signature way. This includes everything from marina operations to services and amenities, which includein-slip high-speed fueling, waste and oil removal, 24-hour security, on property shops and restaurants, and nearby access to the island’s best yacht provisioning, catering, laundry, fitness center and ships’ chandlery. These are all elements that led IGY’s Yacht Haven Grande Marina to be named the 2016 Superyacht Marina of the Year and receive the coveted 5 Gold Anchor Award. Over 100 charter brokers from the Caribbean, U.S. and Europe are expected to attend this ‘must do’ show for international yacht charter professionals. Easy airlift via direct flights to St. Thomas from major U.S. international gateway cities such as Boston, Chicago, JFK-New York, Newark-New Jersey, Washington Dulles, Charlotte, Atlanta, Fort Lauderdale and Miami make it easy to fly to St. Thomas from the U.S. or Europe. For those attending the BVI Charter Yacht Show, the USVI Charter Show offers direct water taxi service from the BVI to IGY Yacht Haven Grande with expedited US Customs clearance. Once in the USVI, there are discounted rates at the Show’s preferred hotels. The 2019 USVI Charter Yacht Show’s dynamic action-packed schedule features four days of yacht viewing, an outstandingopportunity for yachts and crews to highlight signature services, features and amenities to brokers. Plus, there will be a crew cocktail party, awards dinner, sunset cruise, marine expo, and the always anticipated ‘State of the Industry’ address, which highlights many of the off-the-beaten-track anchorages in these world-famous cruising grounds. Sponsors of the USVI Charter Yacht show include the USVI Department of Tourism; Yacht Haven Grande; IGY Marinas; Offshore Marine; the Gowrie Group; Denison Yacht Sales; Moe’s Fresh Market; Stoli, distributed by West Indies Company; Captain Morgan, distributed by Bellows International; the Charter Yacht Broker Association; Cardow Jewelers; Harbor Shoppers and La Royale Cosmetics. 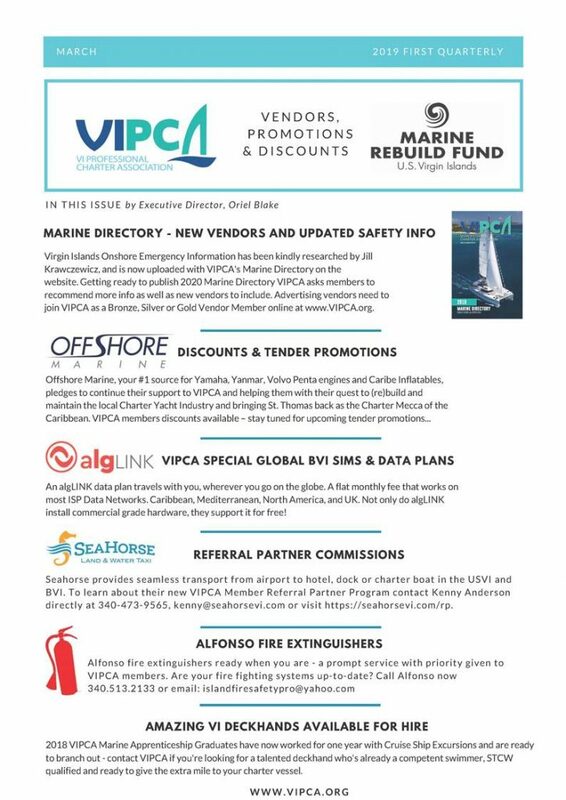 VIPCA is the territory’s 501(c)(6) nonprofit marine association, whose purpose is to promote, protect and further the capabilities of charter yachts and the marine businesses that sustain them. Projects and initiatives VIPCA membership supports includes producing a marine directory of local information, technical advice and resources; improving Customs and Border Protection facilities; gaining ease of access for charter vessels between the USVI and Spanish Virgin Islands; compliance guidance; moving forward a proposal to manage territory wide new transient moorings; marine vocational training for V.I. 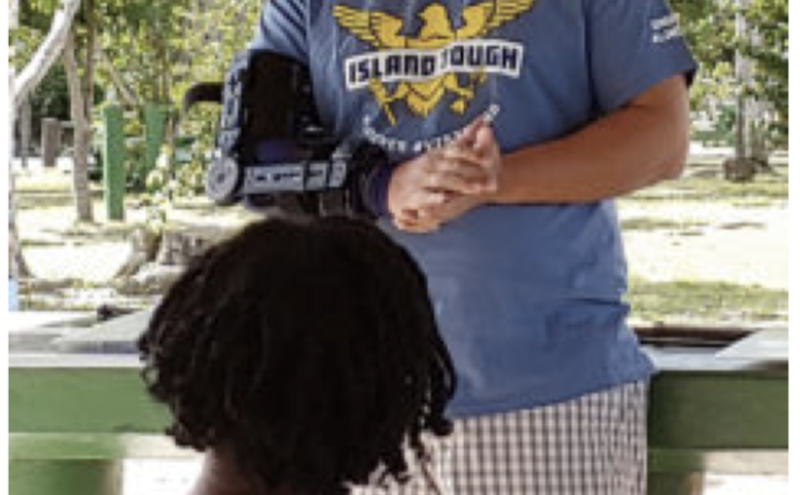 youth; and surveying and cleaning up bays and mangroves under the organization’s charity fiscally sponsored by Community Foundation Virgin Islands (CFVI.net), VI Marine Rebuild Fund. February 19th VIPCA met with the Governor of the U.S. Virgin Islands – Albert Bryan – to discuss the potential infrastructure advancement which could be made to the territory to support the growth of marine tourism. Also discussed was means to encourage VI youth into the marine industry with training to be provided both in marine services and as captains. March 4 VIPCA met with Commissioner of Tourism – Mr. Joe Boschulte – to discuss the necessary support by the Department of Tourism of the industry. March 5 VIPCA met with Senator Fret Gregory to elaborate on the above discussions and do expand upon the contributions made by marine industries to the economy. March 6 VIPCA attended the Governor’s Comprehensive Economic Development Strategy Committee (CEDS) Meeting to discuss the means by which the Marine Industry may be implemental in the 5-year plan. 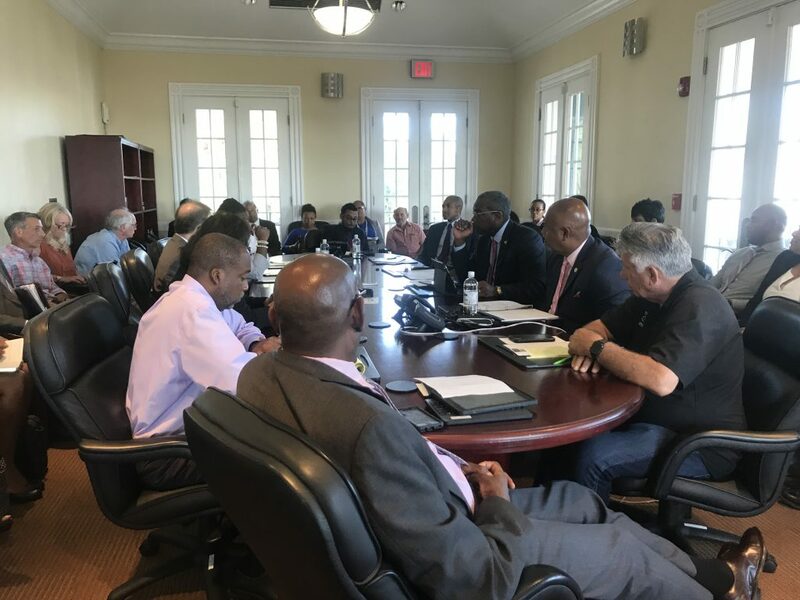 March 6 VIPCA attended the Economic Development Authority USVI “2040” Task Force Steering Committee Meeting to discuss the means by which the Marine Industry may be implemental in the 20-year vision for the territory. March 7 VIPCA attended theBusiness Roundtable Discussion on behalf of the U.S. Department of Commerce – Economic Development Administration to consolidate the above meetings. 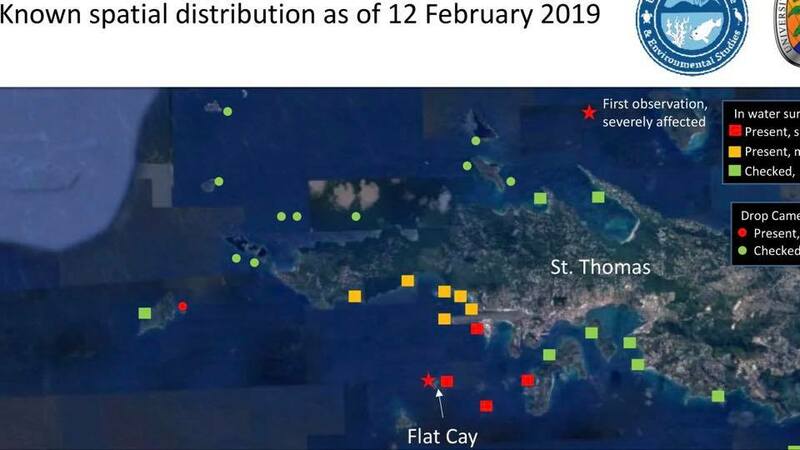 VIPCA attended the public meeting concerning the terrible, contagious and fast moving “Stony Coral Tissue Loss” disease discovered near St. Thomas Airport and Flat Cay. Try to avoid contaminated areas in case of contaminating new areas with your vessel (see map). UVI marine biologist Dr. Brandt and DPNR-CZM Kitty Edwards explained how to report brain and maze corals you have seen infected: www.reefconnect.org/bleachwatch/ or email czm@dpnr.vi.gov with SCTLD. Please help to report in order to assist in saving V.I. corals. Caribbean Compass headline “USVI Charter Show Largest In Over Two Decades” – great quotes, great write-up, and great hope for an even bigger and better show 2019! — at Yacht Haven Grande En St. Thomas USVI. St. Thomas, U.S. Virgin Islands. Nearly 60 multihulls, monohulls and motor yachts lined the docks at IGY’s Yacht Haven Grande on St. Thomas for the USVI Charter Yacht Show, held November 10 to 13, and hosted by the VI Professional Charter Association (VIPCA). Over 100 brokers from the Caribbean, U.S. and Europe toured the fleet, which ranged from 45- to 111-foot in length. This made the 2018 show the largest in well over two decades in terms of the number of yachts showing, brokers in attendance and yacht size combined. This striking fact certainly shows that the U.S. territory’s charter industry is booming. It’s a theme played out on several fronts such as the boutique nature of the industry, virgin cruising grounds and the territory’s public and private sector investments in assuring the success of the marine tourism industry. The boutique nature of the USVI’s crewed charter industry is its prime selling point. Since every yacht has developed its own niche to compete, standards across the board are high. “What we offer is the experience of a European-style hotel on the sea, with an emphasis on high-quality service,” says chef Daniela Drescher, who with Capt. Bernd Forstner, are medical doctors from Austria who sold their flotilla of sailboats, purchased a brand-new Lagoon 52 they named Shangri La, and sailed from Bordeaux, France to the Caribbean in 2016. Starting this season, the couple will offer an optional health and wellness program that spans everything from morning yoga and meditation to healthful meals with culinary instruction and medical monitoring like blood pressure checks. On another tack, captain only charters are the niche aboard the Lagoon 44, Altitude Adjustment, with retired California police Sargent, Brian Saupe at the helm and in the kitchen. “I cater to middle incomers by charting at bareboat or captain only rates, yet I do everything: drive the boat, cook and bartend,” says Saupe, a life-long sailor who since childhood dreamed of living and working on a yacht. Now in his fourth charter season, Saupe purchased his current vessel in the aftermath of Hurricane Irma and subsequently completed 20 weeks of charter from January to June this year. Multihulls dominated the USVI Charter Yacht Show fleet. However, the opportunity to charter a monohull was represented by Ocean Star, a Beneteau Oceanis 60 chartered by Hugh O’Brien and Ellen Davern. “Our guests are sailors. They enjoy heeling over and going fast. Let’s just say we can make it up to Anegada for lunch while the cats won’t arrive there until dinner,” says O’Brien, a former yacht racer who underscores Ocean Star isn’t without its luxuries such as an ice maker, surround sound system and multiple paddle-boards. The Lady Sharon Gale, a 111-foot Broward that underwent a $1.5 million refit in the last year, was the largest motor yacht on display. “We’re a bit of a dinosaur as a monohull as a large percent of the charter fleet today is catamarans, but I think the world need’s dinosaurs,” says Keith Hyatt, captain of the Lady Sharon Gale, which is based in St. Maarten, will relocate to Grenada for the next hurricane season, and spend much of this winter season chartering in the Virgin Islands. The USVI offers advantages to charter crews and clients alike that aren’t found in other destinations. “It’s easy to fly into St. Thomas, plus there are many places to provision, obtain parts and complete repairs,” says Shangri La’s Drescher. This full-service destination is one reason Jon and Kaitlyn Bellemare have based their 83-foot Prout catamaran, Blue Gryphon, in the USVI, specifically at Yacht Haven Grande this season. The couple and crew cast off from the yard in Belfast, Maine, at the end of October to sail south specifically to be part of the USVI Charter Yacht Show. Additionally, anchorages in the USVI are truly virgin. “Everyone wants to make a beeline to other islands, but that means missing so much in the U.S. Virgins. For example, I had a couple for a five-night charter who wanted seclusion. We went to Magens Bay the first night, then over to St. John’s Lameshur, Leinster and Hawksnest Bays, and back to St. Thomas’ Frenchman’s Bay for the final night. They got their wish. We were the only boat every night in each of these anchorages,” says Altitude Adjustment’s Saupe. The Spanish Virgin Islands (SVI), including Culebra and Vieques, are located a little over 20 miles to the west of St. Thomas. “Unspoiled, uncrowded, natural. These are good ways to describe the anchorages and beautiful beaches on Puerto Rico’s offshore islands,” says Lady Sharon Gale’s Hyatt. VIPCA has been working in partnership with the U.S. Customs & Border Patrol agency to enable approximately 45 of its members, who have applied to have the freedom to charter with passengers in the SVI. The ruling is expected in the next few weeks. Public and private sector partnerships are fueling investments in the USVI’s infrastructure that will bolster the marine tourism industry. For one, the Virgin Islands Economic Development Authority is working with VIPCA on over half a million dollar proposal for 100 new transient moorings and restoration of another 100 day charter moorings territory-wide. The first 35 of these moorings will be available in 2019. 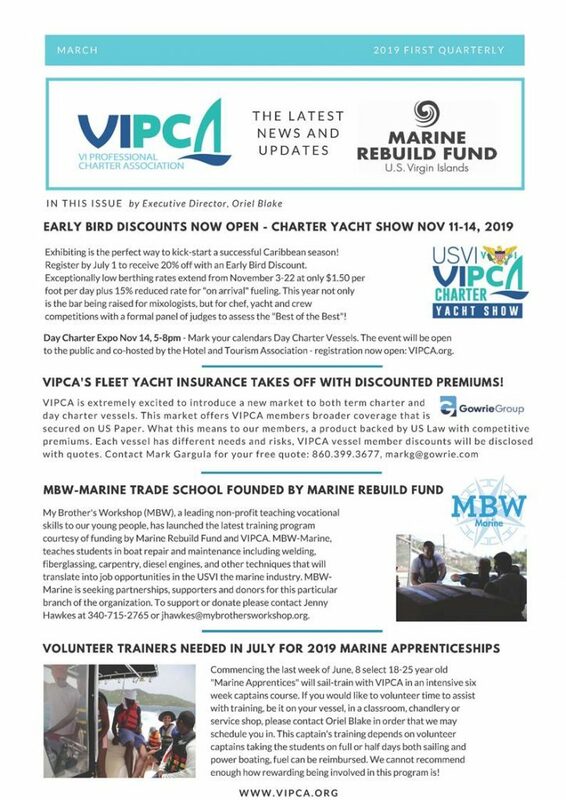 Secondly, is an improvement in customs facilities, Third, VIPCA’s Marine Apprentice ‘on the water’ scholarship program through the Community Foundation of the Virgin Islands’ (CFVI) Marine Rebuild Fund aims to bring more VI captains in the industry. The My Brother’s Workshop (MBW)-Marine ‘on shore’ program educates VI youth about careers in marine maintenance, repair and fiber glassing. “This past year there has been a shift, not only in international recognition of this secret gem of a charter destination, but also in the U.S. Virgin Islands’ own recognition of its marine industry owing its’ combination of resiliency, expansion possibilities and scope for employment. The recent growth spurt in the yacht show represents just that!” Oriel Blake, executive director of VIPCA. 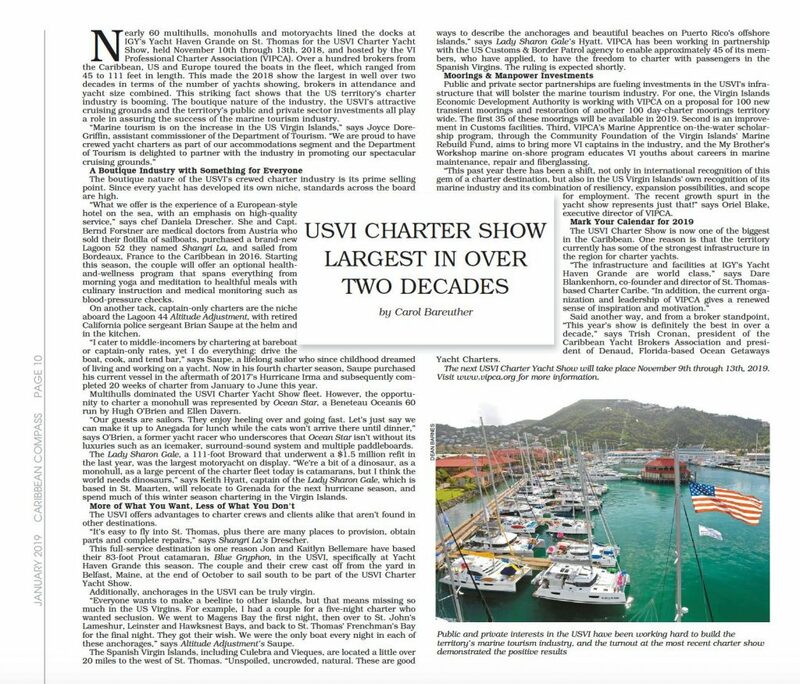 The USVI Charter Show is now one of the biggest in the Caribbean. One reason is that the territory currently has some of the strongest infrastructure in the region for charter yachts. Said another way, and from a broker standpoint, “this year’s show is definitely the best in over a decade,” says Trish Cronan, president of the Caribbean Yacht Brokers Association and president of Denaud, Florida-based Ocean Getaways Yacht Charters. Sponsors of the USVI Charter Yacht show include the USVI Department of Tourism, Yacht Haven Grande, the Gowrie Group, Denison Yacht Sales, Moe’s Fresh Market, Cardow Jewelers, Stoli, Captain Morgan, distributed by Bellows International, IGY Marinas, the Charter Yacht Broker Association, La Royale Cosmetics and Harbor Shoppers.